I am so thrilled I received this book through the FirstReads program. 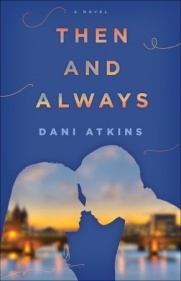 How do I simply sum up Then and Always by Dani Atkins? It’s about parallel universes and what-ifs and second chances and, more thematically, loss and hope and faith. Imagine waking up from an accident with perfect memory of a traumatic 5 years. Only everyone else has a completely different memory of the past 5 years, as if the instigating traumatic event had never occurred. Dani had me hooked, and bawling, from the first chapter – but then again I’m a sucker for the best-friend-your-whole-life romance (team Jacob, team Gale, team Eponine – and now team Jimmy.) Some of the characters seemed cliche and I guessed the plot ending, yet this book still gave me a sleepless night as I ripped through the pages to the end of the story hoping against hope – and what I was hoping for I wasn’t even sure. Which reality did I want to be true? And what did I want the explanation for the other reality to be? I guess I can understand the Rachel’s struggle, myself not sure of what I wanted. I give this story 4 stars, plus 1 star for the best-friend-romance. I know, that last one’s biased, but it’s my review. Loved it!